Existing QSH materials only work at very low temperatures and under difficult conditions, Fu says, adding that "the materials we predicted to exhibit this effect are widely accessible. … The effects could be observed at relatively high temperatures." "What is discovered here is a true 2-D material that has this [QSH] characteristic," Li says. "The edges are like perfect quantum wires." 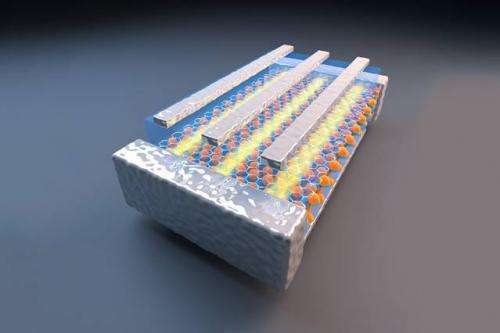 The MIT researchers say this could lead to new kinds of low-power quantum electronics, as well as spintronics devices—a kind of electronics in which the spin of electrons, rather than their electrical charge, is used to carry information. Graphene, a two-dimensional, one-atom-thick form of carbon with unusual electrical and mechanical properties, has been the subject of much research, which has led to further research on similar 2-D materials. But until now, few researchers have examined these materials for possible QSH effects, the MIT team says. "Two-dimensional materials are a very active field for a lot of potential applications," Qian says—and this team's theoretical work now shows that at least six such materials do share these QSH properties. In addition, this is one of the most promising known materials for possible use in quantum computers, the researchers say. Quantum computing is usually susceptible to disruption—technically, a loss of coherence—from even very small perturbations. But, Li says, topological quantum computers "cannot lose coherence from small perturbations. It's a big advantage for quantum information processing." Nai Phuan Ong, a professor of physics at Princeton University who was not connected to this work, says, "Although some of the ideas have been mentioned before, the present system seems especially promising. This exciting result will bridge two very active subfields of condensed matter physics, topological insulators and dichalcogenides."